Good grief, where has August gone to! It's hard to believe it's almost September, although some days felt like October! I'll close out the month with a few random photos that never made it into blog posts. Hops. This is my third try to grow it - success?! Winnowing wheat with a box fan. My Kinder girls wanting me to take them for a walk. Tomato, goat cheese, and sheep sorrel salad. Savoy cabbage that managed to survive the summer. Sam in the barn door. How about you? Are you ready for September? So how are we going to apply the knowledge we've collected in "Carbon: What I Didn't Know?" How are we going to increase soil carbon and build our soils? Soil building is a biological process which requires a symbiotic relationship between living plant roots and soil microorganisms. Some of these organisms break down organic matter, and others secrete a sticky substance called glomalin. Glomalin binds soil particles (sand, clay, and silt) with carbon-containing organic matter to make soil. In addition, carbon is what feeds these microorganisms, so by adding plenty of carbon to the soil, we build the soil. The soil in the southeastern U.S. is extremely poor, so we have our work cut out for us. I've been researching various methods of building soil and have learned that how we're going to approach it will depend on how we want to use the land. To visualize that, I mapped it out. 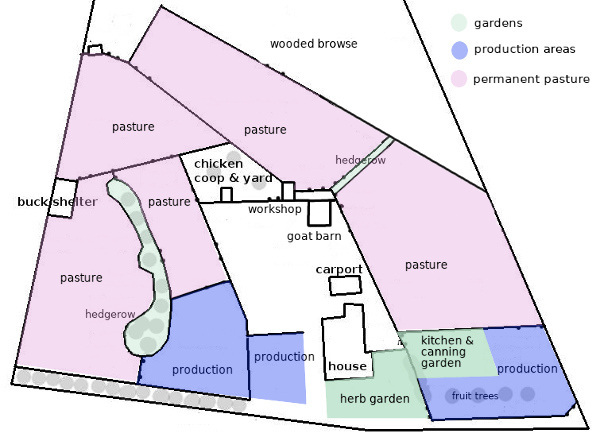 We have three goals in regards to land usage: gardens (green in the map above), pasture (lavender), and areas for producing field crops such as wheat, hay and other winter feedstuffs. Those areas are blue. All of these are the areas for which we need to develop soil building strategies. Gardens. 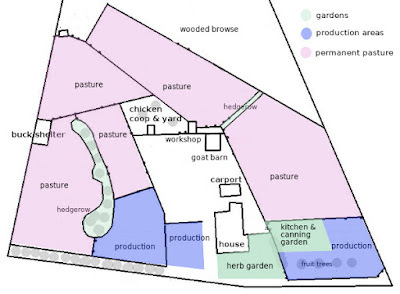 I have a kitchen and canning garden ("the garden") for annual vegetables, a slowly expanding perennial herb garden, and a couple of permaculture hedgerows. These are our smallest areas and so easiest to work with. For the most part, we're already on the right track, because we compost, mulch, and don't use synthetic fertilizers or weed or pest killers. The plan is to continue building my huglekultur swale beds and get back to more diverse companion planting. Pastures. Another area in which we've done some things right is pasture. For these, I've had some success with my Modified Fukuoka Method. I broadcast seed on the bare ground and cover it soiled straw and wasted hay from the goat barn. Mixture of pasture forage seeds growing through barn cleanings. I've only been able to spot seed with this method, however, so progress is very slow. We need to address the entire pasture rather than small areas in it. Cattle people do this with intensive rotational grazing. Our situation presents a few challenges for their method, but this is the direction we're headed. The first step will be to further subdivide our pastures. I'll have more on that later. Field crops. In farming lingo, these would be called "cash crops." But since we're using these crops ourselves instead of trading them for cash, I prefer to call them production crops. Production areas are similar to a garden in that the crop changes seasonally, but they are much larger than a garden and so need different methods for managing. Sam walking through last summer's corn seedlings. Large producers like Gabe Brown build soil on large acreage with cover crops and no-till planting. However, they have large equipment to do so. The smallest no-till seed drills for small tractors run about $7000 - $8000 on up, which is out of the question for us. However, we're not the only ones trying to figure this out. I've been reading and researching and have come up with some ideas to try. I'll blog more about that soon. I feel like we've been trying to figure out a huge puzzle for the last several years, except that some of the pieces have been missing. Finally, those missing pieces seem to be falling into place. It will still require a lot of work and experimentation on our part, but at least I know we're headed in the right direction. Next in this series, "Soil Building Experiment #1." It's been years since we kept a car in the carport. Instead it has been a storage area for tools, equipment, lawn mower, wheelbarrows, welding equipment, and everything else that needed a home. And as if that wasn't bad enough, there were several piles of building scraps and other paraphernalia that really gave the yard a cluttered, unkempt look. Funny how you know something is an eyesore, but as time passes you get used to it. We lamented that from time to time, but it wasn't until we got the goatie girls moved into their not-quite-finished new barn that we could do anything about it. Then it was time for a change. It started with me moving the old milking room out of the former goat barn (aka "The Little Barn") and into the new. More space and a different room shape kept me busy for quite awhile, trying to figure the best place for everything and getting organized. It hasn't worked out like I planned on paper, mostly because I hadn't planned on such a large drying rack for herbs (the shelves you see on the left in the photo above). I planned on a standard 18" x 36" shelving unit, until I found those shelves on craigslist for just $50. They measure 24" x 48" so they take up quite a bit of room, but I'm not complaining! While I worked on that, Dan tackled the carport. Everything got pulled out and either moved to the Little Barn or discarded. It's amazing how much junk can be accumulated over time; stuff that potentially might be useful someday and broken things that theoretically could be fixed. His next step was setting up a proper workshop in the old milking room. His make-do space in the carport was finally at an end. Dan's new workshop, still in the organizational phase. Well, the girders and ceiling joists are in pretty bad shape (photos here). They need repair, but it's still standing. I was pretty sure the only thing holding it up was the tarps we'd attached to serve as walls! The plan is to use it to store firewood on the pallets you see on the ground on the left. All of these changes seem huge: the piles are gone, the junkiness is gone. It's a big visual change and a psychological one as well. All very welcome. I love my Kinder goats! Milk products are an important part of our diet, especially cheese and kefir. (Also ice cream!) Milk production is highest during summer, so that's when I work on making as much cheese as possible for the upcoming winter months. Because I don't have a cheese cave, I've had to learn what cheeses I can make in a hot, humid climate, and how to preserve them for winter eating. What's a cheese cave? Commonly it's a small refrigerator set between 45 to 58°F (7 to 14.5°C) and 80 to 98% humidity. These are the conditions necessary to properly age cheese. People often keep a small fridge like a wine cooler for this purpose. I've thought about getting one, but I honestly don't have the room for it. Instead, I've experimented with cheeses I can make without controlled aging. Here are the ones that are working well so far. The names of the cheeses are hyperlinked to directions for making them. Mozzarella is always first on my seasonal cheesemaking list. It's easy to make, requires no aging, freezes well, and is a must for Friday night pizza! I grate it, measure it, and freeze it in freezer bags. Each bag contains enough for one pizza. These individual bags are stored inside a large paper grocery bag in the freezer. Paneer wrapped and ready for the freezer. I first made this for fried cheese. Then we figured out it was great for snacking, for sandwiches, in eggs, and for added taste and texture in things like refried rice or spaghetti and meatballs. It is absolutely the easiest cheese in the world to make. Follow the link to learn how. The bonus is that it freezes well. In the photo above you see my substitute for freezer paper. Freezer paper has really gone up in price, so I started wrapping things first in wax paper, then in a paper bag or packing paper. Last year I learned to make feta and experimented with ways to keep it. This is a brined cheese, native to the Mediterranean area where caves for aging and storing cheese aren't readily available. Instead, it is aged and stored in a salt brine solution. The aging requires no special temperature, which means it can be done in a refrigerator. Those things make it a good cheese for my climate. Feta curing for two weeks in brine. I made several batches last year and tried two ways to store it: some in brine and some with herbs in olive oil. The feta stored in brine gradually got saltier as time passed. It can be rinsed off in cool water, but what I really liked was the feta stored in herbed olive oil. Crock of feta, rosemary and oregano sprigs in olive oil. The cheese kept a wonderful flavor and the oil's cheesy herb flavor makes it wonderful for sauteing vegetables, for cooking eggs, as a salad dressing, as the oil in pizza dough, or as a dipping oil with French bread. I'll make a couple of crocks-worth of feta in oil for winter eating. For a harder cheese I've been making farmers cheese. It's mild, tasty, and meltier than paneer. Farmers cheese is meant to be eaten fresh, so I make as needed. However, this same basic cheese can be waxed or bandaged and aged for a more flavorful hard cheese. Since aging (curing) a hard cheese requires a specific temperature and humidity range, that means waiting for autumn when our daytime temps drop to facilitate curing cheese. Last fall I made one aged cheese, Farmhouse Sage. It was fantastic, so I'm hoping to make a variety of aged cheeses this year. The problem is that winter is usually the time the does are dried up in anticipation of spring kidding. So my goal is to have at least one doe in milk at all times of year. You can read more about that in my "Year Around Milk" blog post. I'm planning to only breed two does this fall, and milk the other two throughout the winter. Plus, I have Ellie. Hopefully Ellie has been bred for an October kidding. She is my first attempt at an early summer breeding for a fall kidding. For that, we're on wait-and-see status, because I haven't had her pregnancy confirmed. But if I can vary when kids arrive, then that will help with that year around milk supply. Year around milk supply will not only add variety to my cheese making, but also let me keep a year around supply of kefir and chèvre. These are examples of dairy products that can't be stored and so need to be made fresh. Part of seasonal living is learning how to adapt to one's seasonal challenges. It takes a bit of trial and error, but in the long run it's well worth it. 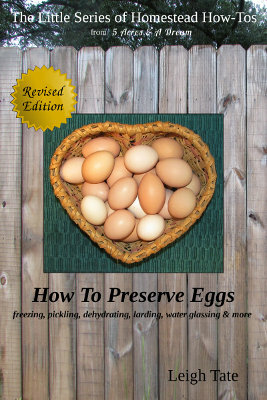 I'm pleased to announce that How To Preserve Eggs: freezing, pickling, dehydrating, larding, water glassing, & more from my The Little Series of Homestead How-Tos has been recently updated and revised. It's now available for free! If you like it, please consider writing a review. Customer reviews are key to sales and ratings. Authors usually have to beg for reviews, and I guess I'm no exception. But if you like a book, any book, writing a review is a very small way to help the author out. To those of you who do and have written reviews for me, a huge thank you! By doing so you are part of the 5 Acres & A Dream support team. My book sales enable us to do so much of what we do, and I'm grateful to everyone who is a part of that. Oh! 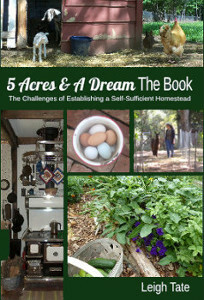 And if you've been wanting to buy a copy of 5 Acres & A Dream The Book, Amazon currently has it priced at $7.77. (Check it out here). That's the lowest price I've ever seen, but I don't know how long that price will last. 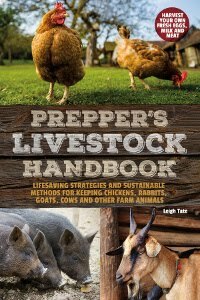 There are several other topics I've been researching, so I hope to have a few more updates to my homesteading series in the future.